F&W Best New Chef 2002 Dan Barber, the chef and co-owner of New York City's Blue Hill and Blue Hill at Stone Barns in Pocantico Hills, New York, strikes again with another insightful op-ed in the New York Times. This time, the subject is late blight, the pesky, fast-spreading plant disease that's made finding flavorful organic tomatoes across much of the Northeast harder this summer than in seasons past. While Barber names several culprits for the disease's severity, he also turns the tables and blames...himself. "It’s a nostalgia I’m guilty of promoting as a chef when I celebrate only heirloom tomatoes on my menus," he writes. (It turns out that 70 percent of heirloom tomatoes have fallen victim to late blight.) Barber's vision of the more resilient farm of the future? One that grows multiple crops, with multiple varieties of the same vegetables—a few heirlooms, yes, but also new varieties bred to resist diseases. Perhaps that vision might cause a ripple of shock across the Slow Food movement, but it may be what's necessary to ensure flavorful produce for the future. 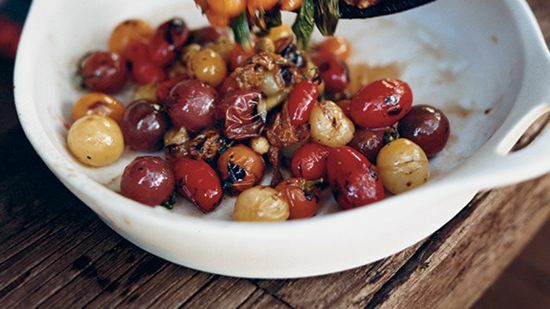 For those lucky enough to get their hands on a ripe, juicy tomato, we offer tomato recipes here. We also offer recipes for other seasonal produce, like corn, eggplant and watermelon.